You have heard the Thunder, for he is everywhere. He roars in the mountains, and far out on the prairie is heard his crashing. He strikes the high rocks, and they fall to pieces; a tree, and it is broken in slivers; the people, and they die. He is bad. He does not like the high cliff, the standing tree, or living man. He likes to strike and crush them to the ground. Of all things he is the most powerful. He cannot be resisted. But I have not told you the worst thing about him. Sometimes he takes away women. Long ago, almost in the beginning, a man and his wife were sitting in their lodge when Thunder came and struck them. The man was not killed. At first he lay as if dead, but after a time he lived again, and, standing up, looked about him. He did not see his wife. "Oh," he thought, "she has gone to get wood or water," and he sat down again. But when night came he went out of the lodge and asked the people about her. No one had seen her. He looked all through the camp, but could not find her. Then he knew that the Thunder had taken her away, and he went out on the hills and mourned. All night he sat there, trying to think what he might do to get back his wife. When morning came he rose and wandered away, and whenever he met any of the animals he asked if they could tell him where the Thunder lived. The animals laughed, and most of them would not answer. The Wolf said to him, "Do you think that we would look for the home of the only one we fear? He is our only danger. From all other enemies we can run away, but from him no one can run. He strikes and there we lie. Turn back; go home. Do not look for the place of that dreadful one." The man kept on and travelled a long distance. At last, after many days, he came to a lodge—a strange lodge, for it was made of stone. Just like any other lodge it looked, only it was made of stone. This was the home of the Raven chief. The man entered. "Welcome, friend," said the chief of the Ravens; "sit down there," and he pointed to a place. Soon food was placed before the poor man. When he had finished eating, the Raven chief asked, "Why have you come here?" "Thunder has stolen my wife," the man answered. "I am looking for his dwelling-place that I may find her." "Are you brave enough to enter the lodge of that dreadful person?" asked the Raven. "He lives near here. His lodge is of stone like this one, and hanging in it are eyes—the eyes of those he has killed or taken away. He has taken out their eyes and hung them in his lodge. Now, then! Dare you enter there?" "No," answered the man, "I am afraid. Who could look at such dreadful things and live?" "No man can," said the Raven; "there is only one old Thunder fears; there is but one he cannot kill. It is we. It is the Ravens. Now I will give you some medicine, and he shall not harm you. You shall enter there and try to find among those eyes your wife's, and if you find them tell the Thunder why you came and make him give them to you. Here, now, is a raven's wing. Point this at him and he will be afraid and start back; but if that should fail, take this arrow. Its shaft is made of elk horn. Take this, I say, and shoot it through the lodge." "Why make a fool of me?" the poor man asked. "My heart is sad. I am crying." He covered his head with his robe and wept. "Oh," said the Raven, "you do not believe me. Come outside, come outside, and I will make you believe." When they stood outside the Raven asked, "Is the home of your people far?" "A great distance," said the man. "Can you tell how many days you have travelled?" "No," he replied, "my heart was sad; I did not count the days. Since I left, the berries have grown and ripened." "Can you see your camp from here?" asked the Raven. The man did not answer. Then the Raven rubbed some medicine on his eyes and said, "Look!" The man looked and saw the camp. It was near. He saw the people; he saw the smoke rising from the lodges; he saw the painting on some of the lodges. "Now you will believe," said the Raven. "Take, then, the arrow and the wing, and go and get your wife." The man took these things and went to the Thunder's lodge. He entered and sat down by the doorway. The Thunder sat at the back of the lodge and looked at him with awful eyes. The man looked above and saw hanging there many pairs of eyes. Among them were those of his wife. "Why have you come?" said the Thunder in a dreadful voice. "I seek my wife," said the man, "whom you have stolen. There hang her eyes." "No man may enter my lodge and live," said the Thunder, and he rose to strike him. Then the man pointed the raven wing at the Thunder, and he fell back on his bed and shivered; but soon he recovered and rose again, and then the man fitted the elk-horn arrow to his bow and shot it through the lodge of stone. Right through that stone it pierced a hole and let the sunlight in. "Wait," said the Thunder; "stop. You are the stronger, you have the greater medicine. You shall have your wife. Take down her eyes." The man cut the string that held the eyes, and his wife stood beside him. "Now," said the Thunder, "you know me. I have great power. In summer I live here; but when winter comes I go far south. I go south with the birds. Here is my pipe. It has strong power. Take it and keep it. After this, when first I come in the spring you shall fill this pipe and light it, and you shall smoke it and pray to me; you and the people. I bring the rain which makes the berries large and ripe. I bring the rain which makes all things grow, and for this you shall pray to me; you and all the people. 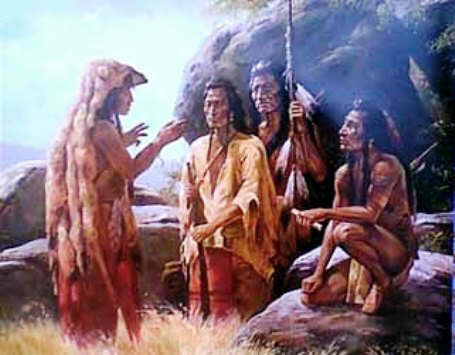 Thus the people got their first medicine pipe. It was long ago.